Across our client base, the consistent demand is to limit course length or to somehow modify the instructional design so that it’s possible for someone to “consume” a course in smaller chunks. As tablets and phones enter the workplace, we also see clients getting excited by “just-in-time” access to ePubs and reference tools. There’s a bigger push to reduce the total time spent in formal training, while conversely a perception that people need more and more information to do their jobs effectively. Listened to 11 lectures ranging in length from 3:27 to 14:37 with the average length appearing to be about 10 minutes. Sometimes I only spent 10 minutes doing course work; at least one other time I spent an entire hour. Completed 2 quizzes that each had 5 questions in them. Completed a homework assignment that required me to write a 300-word essay (took about 30 minutes to do). Did a peer evaluation on 5 essays done by fellow students (took about 30 minutes to do). Didn’t finish the course – another big trend with MOOCs. People seem to grab what they want, which might mean not finishing the entire course. There’s a lot of content in eLearning courses that is not about learning how to do anything. ePubs and web-based reference tools offer a terrific alternative – at a fraction of the cost of eLearning course production. We see two “trends within the trend”: ePubs and videos. 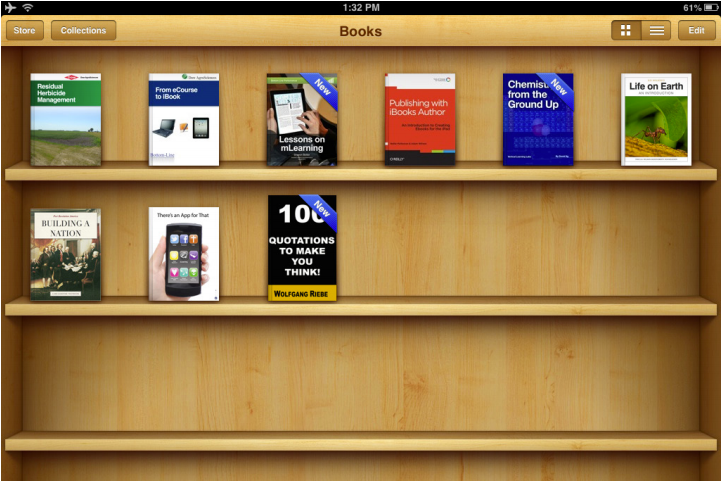 One of the top 10 hits on our blog site in 2012 was a blog about converting an Articulate course to an ePub using iBooks Author. 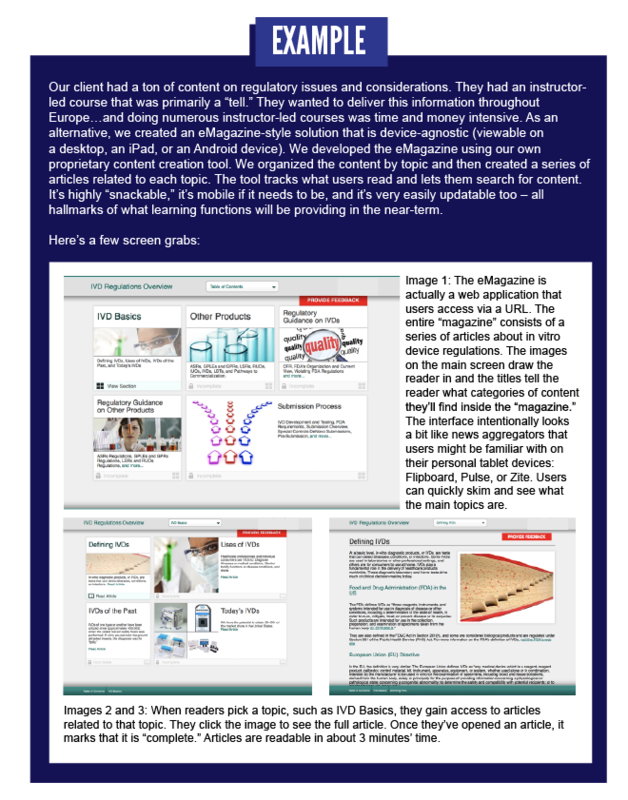 When we presented on this topic at mLearn 2012 and DevLearn 2012, our sessions were full. People recognize that 1) lots of their content doesn’t belong in a course, 2) frequently people need a tool that lets them look something up quickly, and 3) ePubs are a really nice way to address 1 and 2. With iBooks Author, in particular, publishing is a fairly quick process, updates are easy to make, and the opportunity to insert multimedia is almost irresistible. When we show off our inaugural iBook, we always get wows from folks who are enchanted with the interactive nature of it and the ability to digest content rapidly – and return to it easily when needed. We can’t show you the client iBook, but here’s a link to one we created to drive our presentation on iBooks. If you need a solution that goes across devices – desktop, tablet, and phone – and isn’t brandspecific (iPad vs. Android), web applications are gaining ground as a solution. More and more often, companies are recognizing that their people don’t need to remember something forever – they need to find it when they need it. Therefore, a traditional eLearning course doesn’t meet the need. Web apps, on the other hand, can be designed to allow speedy content creation and easy updating of that content. On the user side- they offer quick and easy access when and where you need the access. We’ve become a culture that requires a lot of stimulation via media. We prefer visuals to reading text. We like short chunks and not long diatribes. Video addresses all those issues. Video can be an excellent source of quick how to information or quick overview information. Video is also a terrific replacement for Flash animations inside eLearning courses, providing a mobile-friendly solution to creating animation effects. Here’s a fun video that lets us explain – in about 90 seconds – what our Knowledge Guru learning game is all about. We did usability testing between a text and slide series that explained the game and this video. The video won by a landslide. Other pluses to video that are driving its upward trend: Video can be housed in the Cloud rather than residing on a server. You can also use YouTube or Vimeo to let you stream it rather than sucking up your own server space. Best of all – it is ideally suited for “snack-sized” delivery in small increments. YouTube has also lowered our expectations of production values required for video to be “good.” We’re all used to seeing “home-made” video. For instructional purposes, video does not have to have Hollywood or broadcast production values.